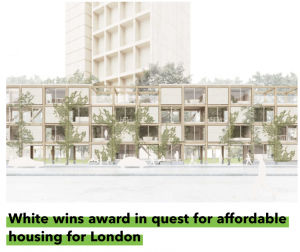 White Arkitekter has won the BB-Green Award in the London Affordable Housing Challenge for its proposal ‘Hedge House’, a new housing typology which uses post-war housing estates to create affordable housing. The London Affordable Housing Challenge, an open international competition, sought a pilot-phase concept for easily rolled out affordable housing to increase the British capital’s housing stock. White’s response was the concept Hedge House, a new housing typology which has a positive impact on the public spaces surrounding London’s many post-war housing estates. It repairs and uses the urban fabric, public parks and spaces between them by addressing what does not currently work, healing the estates without affecting existing affordable homes. With a low site cost, no demolition or loss of existing affordable homes and a small, efficient footprint with lightweight construction that allows for pre-fabrication with a simple repetition of elements, Hedge House ticked all the boxes.